Dump school and kiss your car goodbye. If two bills working through the California Legislature come to pass, this could be the newest slogan in the ongoing struggle to keep teens in school. The two bills, AB2107 and AB2414, would deny provisional driver's licenses to 16- and 17-year-olds if they drop out of high school. While it's nice to see state leaders taking an interest in California's dropout crisis, these bills only offer double trouble to kids already hurt by the failure of schools. Life without basic education and reduced career opportunities is already punishment enough for dropping out. Besides, the bills ignore that there are many reasons students leave high school, and not all of them are related to laziness or delinquency. Indeed, it could simply be that they don't feel safe in increasingly dangerous schools, or they're uninspired by what passes for education on too many of our campuses. In Los Angeles, students sometimes leave because of family financial hardship. How does it benefit anyone to deny a license to a teen who suddenly needs to support her family by getting a job, not allowing her to drive to work? If legislators want to improve the dropout rates, which are particularly appalling in the Los Angeles Unified School District - as much as 50 percent - they would do more by threatening the driver's licenses of school administrators and bureaucrats. The prospect of a commute on the bus filled with current and ex-students they failed would probably do more for improving the dropout rate than this misguided legislation. To his credit, Secretary Bell, a moderate Republican who had been hoping for some political relief from critics on his right, stood by these unexpected words from his commission — and thereby became the unwitting father of the modern school reform movement. Secretary Bell’s boss, President Ronald Reagan, was also taken aback by “A Nation at Risk,” although for different reasons. He took office in 1981 with a three-fold agenda for education: abolishing the Department of Education, promoting tuition tax credits and vouchers and restoring voluntary prayer in the schools. Using the bully pulpit and purse of the federal government to promote “excellence” in teaching and learning was not on the list. When members of the White House staff saw an early copy of “A Nation at Risk,” they were distressed to find no mention of their political agenda and threatened to cancel the ceremony in which the president would receive the first copy. Secretary Bell and commission members replied that such topics were at best tangential to their assigned topic of excellence in teaching and learning. Eventually a compromise was reached. The president agreed to receive the commission and accept the first copy of “A Nation at Risk” at a White House ceremony, and he used his remarks to reaffirm his political objectives — none of which were mentioned in the report. Several members of the commission later confided that they left Washington that day in a depressed mood, convinced that they had been “used” and were destined to be ignored. Then came the biggest twist of all. “A Nation at Risk” resonated with Americans, who seemingly agreed that there was indeed something “seriously remiss” in their schools. White House pollsters picked this up. The president began visiting schools all over the country, usually in the company of Secretary Bell, who until then, as head of a department scheduled for elimination, had never seen the inside of Air Force One. The apocalyptic rhetoric of the opening section of “A Nation at Risk” isn’t the only element of the report that has had a lasting impact. One of the main ideas enshrined in the document — that quality of schooling is directly linked to economic competitiveness — has also shaped the way Americans think about education. This particular theory, however, hasn’t been borne out by history. In 1983, the causal connection between education and the economy seemed obvious. Americans were living in awe of the Japanese “economic miracle” and assumed that it was made possible by a school system whose students consistently routed ours on all those comparative international achievement tests. But then the Japanese economy soured — even though it still had the same education system — and we began asking ourselves another question: If American schools are so bad, why is our economy doing so well? With the wisdom of hindsight, it is clear that the link between educational excellence and economic security is not as simple as “A Nation at Risk” made it seem. By the mid-1980s, policymakers in Japan, South Korea and Singapore were already beginning to complain that their educational systems focused too much on rote learning and memorization. They continue to envy American schools because they teach creativity and the problem-solving skills critical to prospering in the global economy. Indeed, a consensus seems to be emerging among educational experts around the world that American schools operate within the context of an enabling environment — an open economy, strong legal and banking systems, an entrepreneurial culture — conducive to economic progress. To put it bluntly, American students may not know as much as their counterparts around the Pacific Rim, but our society allows them to make better use of what they do know. The question now is whether this historic advantage will suffice at a time when knowledge of math, science and technology is becoming increasingly critical. Maybe we need both the enabling environment and more rigor in these areas. But while the theory behind “A Nation at Risk” may no longer hold (mediocre education inevitably leads to a weak economy), the report’s desperate language may be more justified than ever, for American education is in turmoil. That figure has now dropped to less than 70 percent, and the United States, which used to lead the world in sending high school graduates on to higher education, has declined to fifth in the proportion of young adults who participate in higher education and is 16th out of 27 industrialized countries in the proportion who complete college, according to the National Center for Public Policy and Higher Education. The striking thing about the performance of American students on international comparisons is not that, on average, they are in the middle of the pack — which was also true in 1983 — but that we have a disproportionate share of low-performing students. We are failing to provide nearly one-third of our young people with even the minimal education required to be functioning citizens and workers in a global economy. This is particularly distressing news at a time when the baby boomers are aging and a growing proportion of the future work force comes from groups — members of ethnic and racial minorities, students from low-income families, recent immigrants — that have been ill served by our education system. The challenge today is to build access as well as excellence. That’s the new definition of “a nation a risk” — and ample reason for a new commission to awaken the nation to the need to educate all our young people. Immigration rights marches losing steam? Ongoing crackdowns driving some supporters underground, organizers fear. Two years ago, millions marched for legal rights for unauthorized immigrants in coordinated events across the country. The massive turnouts stunned even supporters,but they also inflamed some opponents of illegal immigration. A year later, the crowds thinned. Now, as they prepare for another round of May Day demonstrations in support of more liberal laws, some Austin organizers say fear and fatigue have sapped some of the marches' vigor. "When year after year you fight and you fight without any kind of real attention and concern by our legislators, it's only logical that people might wear themselves out and maybe get discouraged from coming out again," said Luissana Santibañez of Familias Unidas por la Esperanza (Families United for Hope). "The enthusiasm has diminished," said Josefina Castilloof the American Friends Service Committee. "I think people are really fearful of coming out as they did in 2006 because they know about (U.S. Immigration and Customs Enforcement) and how every immigrant is threatened by being not only detained and deported but being put into jail, and that is pretty harsh." Organizers with the Austin Immigrant Rights Coalition are planning rallies and marches in downtown Austin on Thursday, which is International Workers' Day. The events coincide with demonstrations across the country in support of what is often called comprehensive immigration reform, which generally includes securing the border, creating paths to legalization for illegal immigrants already in the United States, and expanding the number of available visas so that more people can enter the U.S. legally. With Congress failing to enact immigration reforms, federal immigration officials have dramatically stepped up raids and arrests, detentions and deportations. The crackdowns and increased presence of immigration agents in the Travis County Jail are a prominent focus of Thursday's local events, which begin with a 4:30 p.m. rally at the Capitol. Protesters plan to walk past the jail during the march, which starts at 5:30 at the Capitol and ends with a rally at Austin City Hall. Omar Angel, a 31-year-old former day laborer from Mexico, said crackdowns and the presence of agents in the jail checking inmates' immigration status are fostering distrust and fear of law enforcement among undocumented immigrants and their family members, many of whom are citizens or legal permanent residents and fear separation from their loved ones. Despite such fears, some will march because they believe it's important to speak out against the crackdowns, said Angel, who works with Proyecto Defensa Laboral (the Workers Defense Project). Declining participation in the marches may also be due to a feeling among immigrants that the demonstrations haven't accomplished much and that they are powerless to make a difference, organizer Antolin Aguirre said. Immigrant advocates hailed the 2006 demonstrations for helping block legislation that would have made living in the U.S. illegally a felony. But opponents of illegal immigration decried the protests, calling them brazen displays by immigration lawbreakers. A panel of well-known education experts today called on the federal government to take a much bigger role in overhauling elementary and secondary education, partly by establishing large new training programs for teachers and principals and by pumping much more money into education research. In a report timed to commemorate the 25th anniversary of the issuance of the landmark “A Nation at Risk” study, the panel of educators, who call themselves the Forum for Education and Democracy, argues that the nation’s schools are farther behind now than they were when the National Commission on Excellence in Education issued that widely publicized 1983 document calling for sweeping education reform. “While other countries have made strategic investments and transformed their schools to produce results, we have demanded results without investing in or transforming schooling,” Linda Darling-Hammond, a professor of education at Stanford University and co-author of the report, said in a news release. The report urges the federal government to adopt a sweeping plan for training educators, to include new scholarships for prospective teachers, the establishment of the equivalent of a West Point for principals and other school leaders, and the creation of new professional-development schools that would work with universities to ensure that both prospective and veteran teachers learn new skills. “For an annual investment of $4-billion, or less than what we are currently spending per week in Iraq, the nation could underwrite the high-quality preparation of 40,000 teachers annually (enough to fill all the vacancies that are filled by unprepared teachers each year), seed 100 top-quality urban teacher-education programs, ensure mentors for every new teacher hired each year, provide incentives to bring expert teachers into high-need schools, and dramatically improve professional-learning opportunities for teachers and principals,” the report says. The report calls for the share of the federal research budget devoted to education research to rise from 0.2 percent to 1 percent, with much of the additional money to be spent ensuring that educators know of promising new practices. Alexandria, Va. – April 30 – The National School Boards Association’s Council of Urban Boards of Education (CUBE) released findings today of a major research study, What We Think, which surveyed how parents feel about their urban school environments. This survey is a followup to two previous school climate surveys by CUBE, Where We Learn, which surveyed how students feel about their urban school climate, and Where We Teach, which surveyed teachers and administrators. The Parent Teacher Association (PTA) collaborated on the study’s recommendations. Dr. Brian K. Perkins, principal investigator and Professor of Education Law and Policy of the Department of Educational Leadership and Policy Studies at Southern Connecticut State University, conducted the survey which examined the responses of 10,270 parents in 112 urban schools from 17 states. The survey questions gauge parent perceptions about bullying; expectations of student success; influence of race; parental involvement; safety; and trust, respect, and ethos of caring. Particularly striking was the number of male parents participating, nearly 30 percent of the respondents. • Parents believe their child’s school to be a safe place. The majority of parents surveyed viewed their child’s school as a safe place. However, only 42 percent of parents surveyed disagreed that students fight at lot at school. Forty percent of parents were not sure about safety levels when asked about students carrying guns or knives to school. • Parent views vary about the degree of safety in their neighborhoods. The majority of parents (49%) indicated that there had not been violent crimes within their immediate neighborhoods in the past six months, while a quarter of them indicated that there had been. • The majority of parents are actively involved in their child’s school. Three quarters of parents agreed that they visited their child’s school to support activities. • Parents’ believe that their children can achieve and are proud of their accomplishments. The vast majority of parents agreed that their children were capable of performing very well on standardized exams. Additionally, the majority of parents agreed that their children would pursue opportunities in higher education at the community college or university level. Ninety-seven percent of parents were proud of their children. • Teachers and administrators have gained parents’ trust and make them feel respected. The majority of parents (84%) felt that they could trust the teachers at their child’s school. The majority (87%) also felt respected by the teachers. Parents agreed that they felt respected by administrators at their child’s school (83%). • Bullying continues to be an issue at school. Little more than half of the parents surveyed felt that teachers had the ability to stop bullying; with close to 30 percent not sure if this was possible. More than 25 percent of parents have spoken to an administrator about bullying. Parents with students in the middle grades (6-8) were the largest group (nearly 11 percent) to report that their child was bullied during the school day at least once per month. • Racial differences are not viewed to have an impact on a child’s success at school. Race is not a factor in the success of children in their child’s school, according to the majority of parents of urban school children (70%). An analysis finds that they and their children could make up almost 30% of the state's electorate by 2012.
counties. Statewide, the total was nearly 7.7 million. the highest number of such potential voters. in Illinois. It was based on 2006 data from the U.S.
Census Bureau and Department of Homeland Security. Republican to Democratic since 2002. Gabriel Valley, is made up of such potential voters. May 1 as "The Great American Boycott 2006 Day." non-emergency services for illegal immigrants. undocumented immigrants and she does not. comprehensively reform the immigration system. "name and shame" anti-immigrant ideologues. Educational Fund in Los Angeles. Houstonians are increasingly concerned about immigration and its effects on the region, according to the latest annual Houston Area Survey. This finding comes, however, as the same survey finds Latino immigrants are quickly assimilating into U.S. society. The results of the 2008 survey, conducted by the Center for Public Policy at the University of Houston between Feb. 15 and March 5, were released this week. The survey is designed and directed by Stephen Klineberg, professor of sociology at Rice, and his students. The number of respondents who described the arrival of large numbers of illegal immigrants as a “very serious” problem for Houston rose from 43 percent in 2006 to 61 percent this year. By far the most frequently cited reason for this concern was the perceived strain on public services caused by illegal immigrants. The negative attitudes have spread beyond undocumented immigrants: The proportion of area residents who favor taking action to reduce the number of new immigrants (legal and otherwise) who are coming to America grew from 48 percent in 2004 to 63 percent today. A majority still backs granting illegal immigrants a path to legal citizenship, if they speak English and have no criminal record, but that majority has slipped to 56 percent from 68 percent in just the last 12 months. “No matter how you ask the question,” Klineberg said, “every measure shows growing anti-immigrant sentiment.” The public seems increasingly to believe that the nation is being swamped by a rising tide of unassimilable foreigners that it cannot absorb. The data on the actual experiences of Latino immigrants in Houston, meanwhile, reveal a steady and rapid assimilation into the American mainstream. The proportion of the immigrants who report household incomes above $35,000, for example, grows from 16 percent for those who have lived in the U.S. for nine years or less to 22 percent and to 42 percent among the immigrants who have been in America for more than nine and more than 19 years; the numbers rise to 52 percent in the second generation (U.S.-born Latinos with immigrant parents) and to 57 percent in the third generation. Similarly, the proportion of the Latino respondents who conducted the interviews in English rather than Spanish grows from 17 percent among the most recent immigrants to 49 percent of those who have lived in the U.S. for 20 years or more, and to 98 percent of the third-generation Latinos. Similarly, the proportions who think of themselves as “primarily Hispanic” drop progressively from 85 percent among the most recent immigrants to 17 percent in the third generation. Perhaps the most interesting of the findings with regard to Latino attitudes was their perspectives on future immigration. Thirty-nine percent of the Latino immigrants who have been in the United States for fewer than 10 years said the U.S. should admit more immigrants. That number drops to 29 percent among those who have lived in America for 20 or more years, to 25 percent among second-generation Latino immigrants and to just 14 percent in the third generation. The Houston Area Survey has been measuring relations among ethnic groups since its inception in 1982, and the data revealed a significant negative trend in the last two years. This year’s survey found a mild reversal of that trend. The percentage of Anglos, blacks and Latinos who rated "the relations among ethnic groups in the Houston area" as "excellent" or "good" rose over the past year after dropping sharply between 2005 and 2007. Moreover, a solid majority (65 percent) of the survey respondents now agree with the statement, “The increasing ethnic diversity in Houston will eventually become a source of great strength for the city,” up from 60 percent in 2006. No comparable reversal has occurred with regard to perceptions of immigration. The increasingly negative attitudes of the past two years have become more negative in this year’s survey, and the mounting concerns about the press of immigrants on public services has also affected evaluations of the Katrina evacuees. When asked to assess “the overall impact of the Katrina evacuees on Houston,” a growing majority considers the impact to have been a “bad thing” for the city, rising from 47 percent in 2006, to 65 percent in 2007 and to 70 percent this year. Despite such concerns, however, two-thirds of area residents said the Houston community should respond to the evacuees with the same amount or more assistance if another hurricane like Katrina hit in 2008. Only 28 percent thought the community should offer less assistance. Some part of the anti-immigrant attitudes uncovered in the survey may be related to the overall economic downturn, Klineberg suggested. Four years of an upward trend in positive ratings of local job opportunities turned south in this year’s survey. When asked to name the biggest problem facing Houstonians today, the economy crept up from 10 percent last year to 12 percent this year. On that same question, mentions of crime dropped to 24 percent from 38 percent, while the numbers citing traffic congestion jumped from 25 percent last year to the top spot at 35 percent today. The new salience of traffic concerns may be partly due, Klineberg thought, to the public’s growing recognition that another one million people will likely be added to the Harris County population during the next 20 years. The surveys document powerful support for efforts to guide that growth in the years ahead. Fully 61 percent of the survey respondents agreed that more land-use planning would “improve the region’s quality of life and long-term prosperity.” Only 23 percent believed instead that such planning “will slow economic growth and increase the cost of housing.” And 83 percent were in favor of a “general plan to guide Houston's future growth,” with fewer than 11 percent opposed. This is awesome! A wonderful example of the talent in our communities. In sixth grade, Magge Rodriguez was the youngest member of the activist Watsonville Brown Berets. By seventh grade, she was traveling to Sacramento to lobby for education issues. As a junior at Watsonville High School, she helped organize the first homecoming parade through the downtown in decades. This year, as a senior, she was named Watsonville High's student of the year. She's political, she's got tons of school spirit and now the 18-year-old is the winner of a prestigious Gates Millennium Scholars Award, a scholarship funded by the Bill and Melinda Gates Foundation that will pay for her education through a doctoral degree. She's also won the 2008 Princeton Prize on Race Relations and will travel to Princeton University on May 1 to pick up the award. She's been accepted to UCLA, and has been put on the waiting list at Yale. Her plan: Study hard, earn a law degree and come back to Watsonville to defend farmworker rights. "I watched my parents come home from work tired and in pain," said Rodriguez, whose parents worked in the fields when they first emigrated from Mexico more than 20 years ago. "They gave me the opportunity to go to school so I feel it's my duty to educate myself and give back to the farmworkers so they have a better life." Rodriguez, a petite teen with long, wavy dark hair, credits the Brown Berets for putting her on her current path. She knew she wanted to get involved, but the Berets helped her find a way, she said. With the group, she's advocated for education and immigrant rights, against gangs and violence and worked on election campaigns. In particular, activist lawyer Luis Alejo, a founder of the Berets, is a mentor. Rodriguez said he not only helped her find ways to be active politically, but also helped her prepare for college. "I cannot say how proud many of us are of Magge, who has dedicated herself to improving our schools and community," Alejo said in an e-mail. "She is an exemplary role model to the youth of Watsonville, especially young Latinas." Watsonville High School Principal Murry Schekman is a fan, too. He said when he came to the school last year he kept hearing about this group, the Brown Berets. The group, which dates to the mid-1990s, has ruffled feathers in the town, as much for members' sometimes militant expressions as for their politics. Schekman said people told him he needed to meet Magge. He was impressed. He said, for example, when students wanted to walk out over immigrant rights, she helped keep the focus on immigration without losing class time. "It doesn't get better than Magge Rodriguez," Schekman said. "She's an athlete. She's a leader on campus." Of her accomplishments as a school leader, Rodriguez said she's most proud of pushing to get all classes, instead of just seniors, active in homecoming to bring the school together. But she said her most important work was on the Williams lawsuit, a class action suit filed in 2000 that forced the state to address inequities between schools and to ensure every school was clean and safe and that students were provided with proper materials. That, she said, she didn't do for herself, but for future generations, in particular, her 7-year-old brother Emmanuel. "He's already saying he's going to Yale," she said. "He's the big reason I'm work so hard." Will C. Wood Middle School faced a vexing situation when last year's test results came out in August. Most students had met the mark set by No Child Left Behind. But African American students' math scores fell far short of it, bringing the school into failing status in the eyes of the federal law. One hundred students were categorized as black when they took the test last spring. But if the school had fewer than 100 students in that group, their low scores wouldn't count. So Principal Jim Wong reviewed the files of all the students classified as African American on the test, he said, and found that four of them had indicated no race or mixed race on their enrollment paperwork. Wong sent his staff to talk to the four families to ask permission to put the kids in a different racial group. "You get a kid that's half black, half white. What are you going to put him down as?" Wong said. "If one kid makes the difference and I can go white, that gets me out of trouble." Over the past two years, 80 California schools got "out of trouble" with No Child Left Behind after changing the way they classify their students, a Bee analysis has found. The changes nudged their status from failing to passing under the federal law. The state allows school officials to comb through test results every August, changing students' demographic information to correct mistakes that can happen, for example, when clerks register new students or when districts swap student files. Thousands of schools make demographic corrections, and the majority have no bearing on their No Child Left Behind status. But the correction process may allow some schools to escape the scrutiny intended by No Child Left Behind, The Bee found. The state doesn't verify whether the changes schools make accurately reflect the students they serve. And the point of No Child Left Behind lies in separating test scores by race – then demanding educators bring all children to the same level. The law says all major demographic groups – categorized by race, income, English fluency and disability status – must meet test score targets that increase over time. If one group doesn't meet the target, the entire school faces the stigma of low performance and a series of consequences. The Will C. Wood parents agreed to put their children in a different racial group. Two were reclassified as white, and two as American Indian. Sacramento City Unified officials say they have documentation proving the parents were on board with the racial reclassifications. But they would not share it with The Bee. "With our data corrections, we're not looking for the numbers in the subgroup, we're looking at the accuracy of the data," said Associate Superintendent Mary Hardin Young. "We're looking for the accurate information first." When the school's corrected test data came out in February, Will C. Wood appeared to have met all No Child Left Behind requirements. The school reported 96 African American students, instead of 100. Although math scores remained low in the smaller pool of black students, the school was not punished for their performance because the group had become statistically insignificant. Even when a group is small enough to fall off the radar, its students still count toward a school's overall test scores. But lumping students of all backgrounds together has allowed schools to camouflage the scores of students they have under-served. For decades, schools were given a pat on the back as long as their overall test scores looked good – even though the scores of black and Latino children were typically far below those of whites. That's exactly what was supposed to change when No Child Left Behind became law in 2002. "The accountability and responsibility inherent in that law, it's about having to teach kids, not reaching an arbitrary number," said Russlynn Ali, executive director of Education Trust West, a Bay Area group that advocates rigorous academics for disadvantaged students. She said schools are violating the spirit of No Child Left Behind when they take advantage of ambiguous situations and change student demographics in their favor. "This is deliberate gaming of the system, finding a way to shirk the responsibility to close the achievement gap," Ali said. Wong said Will C. Wood is doing everything it can to help low-performing students learn math. About 100 kids a day attend free after-school tutoring, he said. If they stop showing up, the school calls home. Teachers have gotten extra training; students more computer help. Many educators welcome the attention No Child Left Behind has brought to the performance of individual racial groups and say they strive every day to close the gap. But they also feel the system hammers them with arbitrary numbers: Even if student test scores improve – as they have at Will C. Wood – schools are punished if they don't meet specific targets each year. "You're threatened that you're going to get fired, that your staff is going to get fired," said Wong, the Will C. Wood principal, explaining why he changed his students' demographic data. "It's very, very stressful." There's a different stress for parents – worrying if their kids are getting the attention they need. Robbinceta Harris' son was one of the black students at Will C. Wood whose scores became irrelevant after the race reclassifications. She said the school should be doing more to help students learn, not looking for ways to avoid the spotlight of No Child Left Behind. "If they did it the right way, somebody from the outside would have been looking in and saying, 'Why aren't they passing?' " Harris said. • 12 schools changed students' race classification. 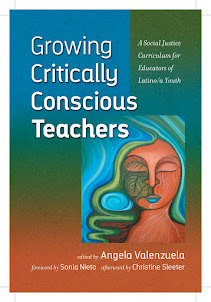 • 50 schools reclassified English learners as fluent in the language – or vice versa. • Seven schools changed which students are considered disabled or economically disadvantaged. • 11 schools changed student demographics in a way that rendered an entire group statistically insignificant, as Will C. Wood did. All told, these schools reclassified 985 students, resulting in increased math and English proficiency rates. By making some demographic groups numerically insignificant, the scores of an additional 815 students were not counted as part of a demographic category. Not all schools that made demographic changes end up doing better under No Child Left Behind. Compared with the 80 schools that improved their standing after demographic corrections, another 33 California schools saw their status drop from passing to failing after their changes. Each school that made beneficial corrections had a different story. In 2007, Main Avenue Elementary in Robla added one high-scoring student to the Latino category, boosting that group's score just past the proficiency benchmark. Principal Ruben Reyes said the boy had erroneously been marked as living in the country less than a year, which meant his score wouldn't count at all. Reyes knew he had been here longer and filed a correction that added his score to the pool of Latino students. The correction took the percentage of Latinos scoring proficient in English from 24.1 to 25.4, inching it past the 24.4 percent proficient necessary to satisfy the law. Herndon-Barstow Elementary in Fresno reduced the number of English learners from 72 to 70, making that group statistically insignificant in 2007. Principal Melody Burriss said a few students were reclassified as fluent in English before spring testing, but the paperwork hadn't caught up with them. Luther Burbank High School in Sacramento made corrections to its English learner category two years in a row. In 2006, Burbank went from 306 English learners to a corrected total of 304, raising the percentage of those students scoring proficient in English from 22.2 percent to 22.4 percent. The No Child Left Behind target was 22.3 percent proficient. In 2007, Burbank lowered the number of English learners from 289 to 275, moving some students out of the category and adding in some high-scorers. The percentage of English learners scoring proficient in English increased from 19 percent to 22.5 percent. The No Child Left Behind requirement was that 22.3 percent be proficient. Principal Ted Appel said most of the corrections were necessary because a large number of Hmong refugees had been put in the wrong grade when they arrived at Burbank as newcomers to the country. No Child Left Behind looks at high school students' test scores only in the 10th grade. In other cases, clerks at Burbank had mistakenly failed to label some students as English learners even though documentation from their parents shows the kids spoke Mien, Hmong, Farsi, Spanish or Tongan at home. Schools like Burbank that serve large numbers of immigrants are likely to correct their demographic data because those students can move in and out of various categories. Over the course of a school year, students can master English and move out of programs for non-native speakers. At many schools, students move in and out of special education. Electronic records become outdated. For those reasons, California will always need to allow schools to correct demographic information, said Rachel Perry, director of accountability for the state Department of Education. Changes to students' ethnic categories are much less common, The Bee's analysis shows. But when it happens, state education officials don't check to see why, Perry said. They leave it up to a private contractor – Educational Testing Service – which performs minimal checks. Appel, the Burbank principal, said the important thing is not whether schools are correcting data but whether they are helping students learn more. At his school, test scores have gone up over the past five years – steeply in math, more gradually in English. After making data corrections this year, Burbank was removed from the list of schools facing No Child Left Behind's consequences. "The way to get out is not by making data corrections," Appel said. "The way to get out is to improve student achievement." Help fight Ariz. bill to ban ethnic student groups like MEChA, Black Business Students Assoc. Please take action today. This bill could reach the Arizona House floor as early as this week. According to newspaper reports, Rep. John Kavanagh (R-Scottsdale), a supporter of the measure called these campus organizations, "'self-defeating' and 'self-destructive' for students." Self-defeating? Multiculturalism doesn't limit students. It gives them pride in who they are and enhances their being fuller people by fostering the concept of America being the land of opportunity. As Cesar Chavez said, "Preservation of ones culture doesn't mean contempt for others'." These student groups are like any other school club or fraternity. They bring students together so they can achieve academic success. They offer a place to meet, make friends and support one another. Their goal is to help students succeed. For example, the members of the University of Arizona's MEChA chapter visit high schools to encourage students to attend college. They hold events and fundraisers to spread the message that education is the key to success. The bill goes one step further. It also would ban public schools or colleges from including race-based classes or school sponsored activities. Officially the language says it would ban any activity "deemed contradictory to the values of American democracy or Western civilization." However, the language is so broad, who knows what could be prohibited? Certainly Chicano studies, African-American studies & other ethnic studies programs will be put at risk. Studies show that students who learn about their race and culture have a lower drop-out rate. In truth, if this bill passes it could cause a huge set back in our educational system. Double digit percentage point gains in passing rates for Pearce Middle School and Johnston High School will be required to meet tougher passing standards. For the two Austin schools most in need of improvement this year, the path to meet the new TAKS passing standards finalized this week by the state won't be easy. Pearce Middle School in East Austin, where the district held a planning forum Tuesday evening, will have to show double-digit percentage-point gains in the passing rate for this year's science test. Students will take the test for the first time this year on May 1. Campuses must meet state standards within all student groups on all subjects on the Texas Assessment of Knowledge and Skills or risk closure. Pearce, now entering its third year of "unacceptable" status in the accountability system, could be closed by the state this year. State officials said passing rates at Johnston High School would have to show significant gains on both the math and science portions of the tests, which students take at the end of this month and in May, to keep that campus open. Superintendent Pat Forgione thanked parents at the forum and said their support for helping students and keeping the campus open is critical. "This is like preparing for a hurricane. Tonight, we have a storm warning," he said. In recognition of the uphill battle Pearce faces, several East Austin advocates have been pitching in to help. Michael Lofton, a local talk-show host who organizes monthly conferences for African American men and boys, said he and members of other groups, including churches and local neighborhood associations, have met to coordinate mentoring and social services for Pearce students and their families. "I know this is kind of at the 99th hour," Lofton said. "But if all goes well, I think we can make a lot of headway by the end of the year." Most observers agree that meeting the state's new 2008 passing standards will be difficult for schools like Pearce and Johnston. This year, the minimum passing rate for English has been increased from 65 percent to 70 percent. In math, 50 percent of students must pass, up from 45 percent, and in science it went from 40 percent to 45 percent. Both schools could get a reprieve by getting just to the "acceptable" standard. 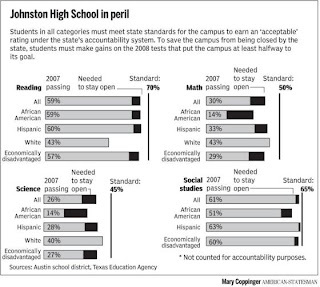 Johnston would have to improve performance in 20 areas to meet that so-called required improvement standard. Pearce would have to do it in 16 areas. 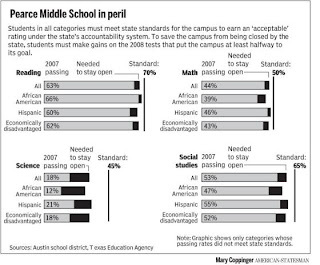 Reaching that standard is what got Webb Middle School in North Austin off the state's low-performing list and saved it from the threat of closure last year. One student designed a palm tree with the dots on the answer sheet. Another breezed through 60 questions in five minutes. Others answered questions based on the quintessential teen attitude: whatever. As schools across the state hunker down for annual tests that determine their fate and reputation, high school teachers face the daunting challenge of motivating students who may not know - or care - about the high stakes involved. Already cramming for exit exams, SATs and advanced-placement tests, many teens think they have nothing to gain by acing, or even trying much, on the Standardized Testing and Reporting - STAR - tests. STAR test season culminates now with a week of multiple-choice exams given from grades 2 through 11. And while elementary school teachers have little trouble cajoling students to "do their best on the test," some high schoolers see it as a chance to take a weeklong breather. "There are people who show up late every day and do half the test," said senior Mike Laccabue of Monta Vista High in Cupertino. And while he himself never completely blew off the test, "I never cared if I got something wrong." Mostly, he said, students "try to do it as quickly as possible." Then they catch up on class reading or listen to MP3 players. Local educators emphasize that the overwhelming majority of students take the STAR tests seriously - and the comparatively high scores at South Bay schools indicate that they're right. But they worry about those who don't. While the tests have no bearing on students' grades or what college they get into, it matters hugely to schools and districts. The state compiles students' results into a single score that indicates how the whole school is doing. That number helps determine whether the campus is honored as a "blue-ribbon" school or whether the state takes it over for "failing." "It's important for students to realize that this is how schools are actually judged, and that they're honoring their teachers," said Donna Hope, principal of Leigh High in San Jose. How much student effort counts was vividly illustrated two years ago, when students at Downtown College Prep deliberately flubbed the test to protest the layoff of four popular teachers. The school's score plunged 203 points, the second-biggest drop in the state. Last year, seeing how their anger had hurt the school's reputation and ranking, students applied themselves and the school bounced back 173 points. Educators have resorted to carrots and sticks - ranging from parties to threats of remedial class - to get the kids motivated. Among the sticks, students who perform abysmally on the state test may have to enroll in a remedial math or English class - and sacrifice an elective, said John Najac, principal of Independence High in San Jose. At other schools, students may be denied enrollment in AP or honors classes if their state test scores are too low. Among the carrots is less homework and, at some schools, minimum days. The Santa Clara Unified School District provides granola bars and water to all test-takers, and a barbecue and pool party for top scorers. At the district's New Valley High, test-takers get a chance to win passes to Great America or Golfland. Nearly all schools enlist support from home by sending letters asking that students be prepared and well-rested. Hope at Leigh High tells students their parents' property values will increase with higher scores. At all schools, juniors who do well in math and English may qualify to skip basic English or math at California State University campuses. Then there's school spirit. At Branham High School in San Jose, Vice Principal Mike Posey promises to dye his hair blue, one of Branham's colors, if the school gains more points than rival Leigh High does. At San Jose High Academy, student body President Korie Benavidez has become an academic cheerleader. In his morning announcements, he chants "680 is the name of the game," a slogan painted on banners strung in hallways. That means the school is hoping to achieve at least a 680 on the 1,000-point scale. Educators insist that getting students engaged is half the battle and point to steadily rising scores as evidence that their boosterism is succeeding. "Given the right information about the exam, students want to do well," said Deborah Sigman, director of the Department of Education's standards and assessment division for the state. Junior Leena Suleiman of San Jose High Academy has studied intensely for the two international baccalaureate tests she'll take next week. And although she says she'll try hard, she admits that STAR "is not my No. 1 priority." Sophomores Alex Barrera and Jaskaran Sohi both said they intend to try hard, but they know not all of their friends will. "They say, 'We don't really care; we don't want to go to college,' " Jaskaran said. That's why serious students try to pump up their classmates. Kids at some schools actually study for the exams. "We want to be able to say that we graduated from a good school," said Claudia Flores, 17, a San Jose Academy senior headed to Santa Clara University next year, who knows that the student body's collective score reflects on her. "But many students don't take it seriously." The STAR test does have pluses for students. "There's this advantage that your teachers don't give you that much homework," Monta Vista's Mike said. And seniors, who are exempt, really like test time. "This year I'm blessed, 'cause I don't have to take them." They rebel at their own peril, however. Chew was suspended for nine days without pay by his principal. But today --- sitting at home while a substitute teacher takes his place -- he is a rock star among parents and teachers who have blamed the testing for stamping out the love of learning in children. But Joe Willhoft, assistant superintendent for assessment and student information in the Seattle Public Schools, told ABCNEWS.com that the WASL is a good tool for measuring student achievement. "I don't think we are getting an overabundance of pressure from parents," he said. "But I do think teachers feel the need to overmotivate students, and it's my hunch some comes from principals." But where does anger over view of 'world' come from? Earlier this month, the makers of Absolut Vodka issued a public apology for running an ad with an early 1830s map of North America with the words "In an Absolut world" emblazoned across the front. The retraction came as a result of a threatened boycott initiated by conservative talk radio and Web sites. Who was Absolut apologizing to and why? The ad itself ran in Mexican magazines and was aimed at an international audience. I would never have even come across it had it not been brought to my attention by this controversy. The complaints seem to range from concern the ad legitimizes undocumented immigration to fear Absolut is advocating an invasion of the American Southwest by Mexico. These objections tell us more about the viewer than the map. Conspiracy theorists circulate the idea that Mexico is slowly reconquering the land through immigration. I was once asked what I knew about la Reconquista, as it is termed. I told them I never got the memo from central command. As a history professor, I find these public discussions revealing of popular thinking about Mexico and Mexican origin people. For me, it was good timing, too. The map appeared on the same week I lectured on the American invasion of Mexico in 1846. Over the years I have observed ignorance or reluctance to discuss the war and the resulting appropriation of almost half of Mexico's territory. Most of my students didn't know that American troops occupied Mexico City. All one needs to do is hum the first line of the Marines' Hymn to remember. More importantly, Mexicans have not forgotten. Mexico's foreign policy is still defined against American intervention. Recent politics also remind Mexican-origin people of a time when traversing this territory didn't mean harassment or having to prove you belong. Instead, the border has become normalized in American culture. It's as though it has always been there since time immemorial. Or, at least that is the way it was always intended to be. The apology by Absolut has turned history around. Bringing up the old map and recalling this history is now an affront to some Americans. Much of the rhetoric around immigration positions residents as "victims" and American culture as under attack. It is no wonder that an eighth-grade student in Athens, Texas, recently invented the story of having been attacked by three Latino kids when she brought an anti-immigration sign to school. Even if it didn't happen, that's how kids are taught to feel about Latinos. Yet the Absolut ad does have some kernel of truth to it. One student in my class said that the ad was probably meant to reveal the thoughts of a vodka drinker after a few rounds. There is a public memory within the Mexican-origin community about the period before 1848. That memory is of a fundamental connection to this land despite being made to feel like outsiders or visitors. The flash of controversy around the map made me think about the perspective raised by Democratic presidential candidate Barack Obama in his recent speech on race. While disavowing his preacher's message, he asked Americans to acknowledge that alternative racial perspectives do exist within our various communities. Mexican resentment about 1848 comes from the discrimination experienced in the years afterward. The conflict escalated from its start as a border dispute over Texas annexation. The fact of the matter is the invasion of Mexico had its American detractors in 1846 and many then were deeply ambivalent about the way this territory was acquired. Rep. Abraham Lincoln voted against the war and Henry David Thoreau wrote Civil Disobedience because of it. But we as a nation still can't go there, yet. As a historian, I always note that the border was not always as it is now. The map (used in the Absolut ad) reminds us of that past. It also means that the border will continue to change. Presently, the border is hardening as the Department of Homeland Security bulldozes private property, nature preserves and federal regulations to quickly build a fence. The pendulum may eventually swing in the other direction. With the euro at an all time high against the dollar, the European Union serves as an alternative model of borders that might one day apply to NAFTA members. In that case, the "Absolut world" map might not have any borders at all. Ramos is assistant professor of history at the University of Houston and author of Beyond the Alamo: Forging Mexican Ethnicity in San Antonio, 1821-1861. (CBS/AP) Federal agents arrested hundreds of people in raids at Pilgrim's Pride chicken plants in five states, the latest crackdown on illegal immigrant labor at the nation's poultry producers. In separate sweeps Wednesday, authorities also arrested dozens of workers at a doughnut factory in Houston and the operators of a chain of Mexican restaurants in upstate New York. The arrests at Pittsburg, Texas-based Pilgrim's Pride Corp., the nation's largest chicken producer, included charges of identity theft, document fraud and immigration violations. The company worked with Immigration and Customs Enforcement agents ahead of the raid, said Ray Atkinson, a company spokesman. "We knew in advance and cooperated fully," Atkinson said. Julie Myers, homeland security assistant secretary for ICE, confirmed the company is cooperating, though she said the raids grew out of an investigation that produced arrests last year at the company's plant in Mount Pleasant. No criminal or civil charges have been filed against Pilgrim's Pride, which has about 55,000 employees and operates dozens of facilities mostly in the South, Mexico and Puerto Rico, supplying the Kentucky Fried Chicken restaurant chain and other customers. ICE said nearly 300 were arrested, but Pilgrim's Pride officials said about 400 hourly, non-management employees were arrested. "We have terminated all of the employees who were taken into custody and will terminate any employee who is found to have engaged in similar misconduct. We are investigating these allegations further," Atkinson said in a statement. Forty-five people, all illegal immigrants, were arrested in Mount Pleasant on charges of false use of Social Security numbers, ICE said. More than 100 people were arrested on immigration violations in Chattanooga, Tennessee, and they could face criminal charges related to identity theft, the agency said. Another 100 were arrested on immigration charges in Moorefield, West Virginia. More than 25 people face immigration violation charges in Live Oak, Florida. They will also face identity theft or document fraud charges, ICE said. More than 20 were arrested in Batesville, Arkansas, on federal warrants for alleged document fraud or identity theft. A statement sent Wednesday by ICE to CBS News said "those arrested on federal criminal charges will be in the custody of the U.S. Marshals Service pending the outcome of their case. Others administratively arrested for immigration violations will be interviewed by ICE, and by the Department of Health’s Division of Immigration Health Services, to determine if they have medical, caregiver, or other humanitarian issues." Pilgrim's Pride has had previous trouble with employees in Arkansas. In January 2007, police arrested a manager at the company's De Queen plant who rented identification documents for $800 to get a job there. The company has said its policy has been to fire employees who cannot clear up discrepancies in their documentation. Wednesday's coordinated raids began at 5:30 a.m., said John Ratcliffe, U.S. attorney for the Eastern District of Texas. He said agents went to homes as well as the plants. Ratcliffe said authorities were working to ensure that any children of detained workers were getting proper care. Texas Child Protective Services spokeswoman Shari Pulliam said the agency was notified about the raid but has not had to take custody of any children. "I hope that the message from today's operation is clear," Ratcliffe said. "We are intent on stopping immigration fraud and identity theft and we will aggressively prosecute anyone who uses another person's name or Social Security number for the purpose of working illegally in this country." Those whose identities were stolen were denied benefits, told they owed taxes and even arrested as a result of the crime, Myers said. DJs on a Spanish-language radio station told listeners to be careful Wednesday after reporting news of the raid. After the arrests, many of the dozens of businesses in town that cater to Latino immigrants had few customers or none at all. "It's sad and scary," said Sheita Delacruz, who works at her mother's dress and gift shop. It was at least the fourth round of raids at U.S. poultry plants in the past three years. Agents arrested about 160 illegal immigrants in Fairfield, Ohio, last May. Separate raids three months apart in 2005 netted about 120 arrests each in Arkadelphia, Arkansas, and Stillmore, Georgia. The poultry raids were the largest of several immigration enforcement actions across the country Wednesday. Agents arrived before dawn at a Houston doughnut plant and arrested almost 30 workers suspected of being in the country illegally. Robert Rutt, the agent in charge of the Houston ICE office, said some of the people arrested lived at the Shipley Do-Nuts dough factory, a four-block plant that includes a dormitory for workers. In Buffalo, New York, federal law enforcement officials announced the arrest of a local businessman and 10 restaurant managers accused of employing illegal Mexican immigrants in seven restaurants in four states. Authorities also arrested 45 illegal immigrants during raids in western New York; Bradford, Pennsylvania; Mentor, Ohio; and Wheeling and New Martinsville, West Virginia. Authorities said the workers were forced to staff the Mexican restaurants for long hours with little pay to work off smuggling fees and rent. The restaurants' owner, Simon Banda, who also uses the name Jorge Delarco, of Depew, New York, is charged with conspiring to harbor illegal aliens. He appeared in court without a lawyer Wednesday and was given until Friday to hire one. Magistrate Judge Hugh Scott ordered him detained until then. In Atlanta, a federal grand jury indicted 10 people from suburban Atlanta employment agencies on charges they placed illegal immigrants in jobs at Chinese restaurants and warehouses in six states. The agencies are accused of developing a network to "recruit and exploit" undocumented workers, said Kenneth Smith, special agent in charge of the ICE office in Atlanta. Between October 2006 and April 2008, the agencies advertised their services and charged immigrants a fee for finding a job, without requiring any proof that the workers were allowed to work in the U.S, prosecutor David Nahmias said. Authorities accuse the restaurants in Kentucky, New York, Pennsylvania, Tennessee, Florida and Alabama of providing housing and paid workers in cash to avoid taxes, Nahmias said. The charges are not related to the Pilgrim's Pride raids. High school seniors applying to college this year are facing the stiffest competition ever seen, leaving many top students shaking their heads in disappointment and others waiting until the last minute to make up their minds. The application ordeal is about to get a little easier for high school seniors across the country – but not for kids in Texas. The number of graduating seniors is expected to decline from this year's high of 3.3 million students nationwide over the next several years, but it is projected to grow by 20 percent in Texas, according to figures from the Western Interstate Commission for Higher Education. Texas' growing population, fueled by an increase in young Hispanics, will make it harder for students vying for a limited number of seats and scholarship dollars in their home state. "The national picture is almost 180 degrees of what you can expect to see in Texas on the total numbers side," said Brian Prescott, a senior research analyst at the Western commission. "You're going to see a great deal of competition over scarce slots." Population growth explains only part of the national pinch. The crunch is compounded by a growing number of students applying to a large number of schools – in some cases more than 10 – in hopes of boosting their odds of acceptance. That phenomenon helped push acceptance rates to an all-time low at several elite national universities this year. Harvard, for example, accepted only 7 percent of applicants. In Texas, the top 10 percent law, which guarantees admission to state universities for top students, provides assurance for some seniors, but makes it even tougher for others to score seats in the strongest schools. About 81 percent of Texas students accepted at the University of Texas at Austin this year were admitted through the top 10 percent law. "If you're not in the top 10 percent, then the competition you face to get into UT-Austin can be as intense as for an Ivy League school," said Gary Lavergne, the school's admissions research director. "It's very, very tough." The competition has also helped prompt application surges at several other Texas schools. At Southern Methodist University, the acceptance rate has dropped to an estimated 49 percent this year from 89 percent 10 years ago, university officials say. The number of applications has doubled to 9,000 during that time. This year's admissions race surprised many students who were rejected by their first and second choices. Gabrielle Solis, 16, found out two weeks ago that she was not admitted to her top choice, Harvard. Gabrielle said she is ranked 12th in her class of nearly 700 seniors at Duncanville High School. "Since second grade, I have wanted to go there," said Gabrielle, who will be the first in her family to go to college. "I had skipped two grades, so I thought that would help. It was a shocker to me." Also rejected at Rice University, she now hopes to go to Dallas Baptist University. The high rejection rates at top-tier schools have also put a damper on senior year for many students. Kim Rose, director of guidance in the Highland Park district, said many students got into top schools, but they don't appear as excited as seniors in previous years. She suspects that's because they feel badly for friends who were rejected by their top choices. "We haven't seen the level of enthusiasm, and I think that is because of the stress factor," she said. Guidance counselors in Highland Park used to recommend that students apply to five to seven schools. Now, they suggest seven to 10 schools. Common application materials and electronic filing have made it far easier for students to file multiple applications. That application increase – multiplied by a few million students – makes it harder for colleges to predict how many of the accepted students will enroll. Many schools require students to put down a deposit by May 1. "This is a very nervous time of year for us," said Alice Reinarz, an assistant provost at Texas A&M University. "We've sent out a lot more letters than we have seats." Going forward, college officials in Texas and other high-growth states will need to review whether they have the buildings and staff to handle the boom, said John Barry, a vice president at Baylor University. National projections represent overall averages. Demographers expect many southern states to grow, while declines are expected in the Northeast. "The system only supports so many faculty members, so many students and so much housing," Mr. Barry said. "A boom in population will really tax those systems." More than ever before, students who want to be competitive will have to do their research in the coming years. Students should no longer assume they will automatically get into a school because they appear to meet the average requirements, counselors say. "We never use the word 'safety' anymore," said Veronica Pulido, director of college counseling at St. Mark's School of Texas. "Nothing is a secure shot anymore." •Research college options early in your high school career. •Apply to a range of schools, including at least one that's likely to accept you. •Do not assume you'll get into the school your parents attended. •If you're in the top 10 percent of your class, apply to at least one public university. •Consider attending a community college before transferring to a four-year school. Note: Acceptance rates are rounded to the nearest whole number. Kathy Francescani sits inside a library storage closet at Joseph Gallagher School on West 65th. It's a small, rectangular space with glass walls and the feel of a bunker. Stacks of textbooks reach from floor to ceiling, bindings bright in blues, yellows, and reds, making the place feel like a fortified rainbow. This is her office. Francescani is one of 12 literacy coaches who work at Cleveland schools that are deemed failing by the state. And Joseph Gallagher may be the worst: It hasn't met yearly progress goals for six years. Francescani's blond hair dances across her shoulders, and she has soft blue eyes, almost like a doe. Before landing her current job, she taught primary grades for 20 years. It's apparent in the way she speaks. Her words are clear and melodic, spilling out like a sugary bedtime story. But this is the first time she's worked in a school full of kids who barely speak English. Their lack of language skills is evident in the stacks of test data that sit behind her desk. They're filled with statistics and scores for all 822 students in the Pre-K-8 school. And what they say isn't good: Joseph Gallagher is teetering on the edge of failure yet again. The designation comes from the No Child Left Behind Act. It's that one-size-fits-all law passed by Congress, decreeing that every child's test scores must improve. And when they fail to as repeatedly as they have at Joseph Gallagher, the state has the right to kill the school. It's tough love to the max. But Congress didn't seem to have Joseph Gallagher in mind when it passed the law. Inside the school's brick halls is a miniature gathering of the United Nations. Bosnian students walk in single file to gym class with Puerto Ricans and Albanians, while Ukrainians and Burundians take sips off a drinking fountain. Many don't speak English. The ones who do don't do it well enough. It's like asking the children of Strongsville to suddenly become conversant in Farsi. So due to a simple law, the entire staff at Joseph Gallagher may soon be fired because some 11-year-old named Nzeyimana can't use the word "prowl" in a sentence. Joseph Gallagher rests between a row of ornate Victorian houses on Franklin and a row of beat-up colonials on Bridge. It's a three-story hunk of brick, with crisp angles and few exterior windows. Surrounding the school is Detroit Shoreway, where multi-bedroom homes with cheap rent are ideal for immigrants and refugees. It's close to the bus lines, and up the street, there's a mosque where Turks and Somalis worship. Among the refugees at Joseph Gallagher is Sheikhabdi Aweys, a petite 22-year-old who grew up in refugee camps in Somalia and Kenya. When the teacher's aide was a teenager, Catholic Charities offered his family the chance to come to the United States. They boarded a plane without knowing what city it would land in. "Then we were given four months to find work, learn basic English, and find a place to live," he says. "It was frustrating." As Aweys walks through the halls with soft steps, kids ask him questions. In one 20-second period, he talks to three different students in three different languages. Whenever a new refugee parent comes into the school, Aweys is pulled from his classroom duties to translate. Depending on the family, the language of the day may be Maay-Maay, Swahili, or Somali. And within those languages are numerous dialects. The difficulty of such translations makes Sunday Times crossword puzzles seem like a game of Bop the Gopher. At 10:30 in the morning, after math tutoring, he heads to the second floor and into a class for students who are newcomers to the United States. He greets the teacher, Holly Morell, and sits down to one-on-one reading lessons. For Morell, a woman with a smile that could soothe an angry bull, every day is a fight. A gold cross hangs from her neck to provide hope. Morell gives out her home number to every student, in case they have any questions about their schoolwork or what to do on a snow day. If there is something comforting about America, it's her. The program she leads is designed to help the immigrant and refugee students, who pour steadily into the school each year. Morell gives them a crash course in survival English, teaching them things as simple as saying "Hello." In another lesson, she explains that "Sam" — SSAAAAMM — is a name, just like Muzamil, Congera, Npaweni, and Kapa are names. This year, her students are a mix from Somalia and Burundi. They wear their poverty on their shirts, which were once white, but now tinged yellow. Like every student in the school, they're on the free lunch program. Many are forced to communicate like mutes, tapping and pointing to express something as minor as needing a pencil. Along with language, Morell teaches simple customs. This year, she finds herself trying to break the students' habit of holding each other's hands. It's something she feels uncertain about, but knows that if they continue, they'll open themselves up to ridicule in the neighborhoods. Fourteen-year-old Abdikadir is her unofficial aide-de-camp. He's about to finish the program and move into the English-as-a-second-language classroom. He's a round kid who wears a Shawn Marion jersey beneath his white shirt and airbrushed images of Tupac stenciled on his shoes. Abdikadir functions as the school's interpreter when Aweys is away. He's the only kid who can speak Swahili, Maay-Maay, and Somali, and translate them to English. It's a ridiculous feat for a 14-year-old, but he'll get no acknowledgment from the state. The Ohio Achievement Test, on which the school's fate rests, does not give points to pint-size boys who've mastered multiple languages. The only language that matters is English. He acts as the classroom interpreter. This afternoon, he has to explain to Morell that one student hit another student with a bag of potato chips. He relays the information quickly, annoyed at being forced to do their tattling. Then he gets back to the word-find puzzle sitting in front of him. All he needs is the word "puddles," and he'll be finished with his assignment. It's the one word that separates him from computer time. Time is something Gallagher Principal Jennifer Rhone lacks. She spends her day jumping from academic maelstroms to administrative maelstroms, without much hope of getting free. Pinned to her door is her daily schedule, right down to the minute. A Canadian flag hangs behind her desk. She came to Ohio from Ottawa, but Rhone looks as Canadian as Barack Obama looks like a typical kid from Kansas. Her hair is dyed auburn, and she can pull off large hoop earrings. This is her first full year at Joseph Gallagher. And today is like any other. A Kenyan family sits outside her office. They came this morning to enroll their kids, which will push Gallagher's numbers to capacity. But she can't help them until she finds an interpreter. Few of these new families speak English. Before she can do that, an aide shows up at her door with two students caught roughhousing during gym class. Then the phone rings; a teacher needs her in another part of the building. Meanwhile, staticky voices chirp from her walkie-talkie, her computer beeps out e-mail notifications, and a secretary pops in to relay a meeting reminder. "My days are pretty full," she says. Every day, Rhone parks her Pontiac Sunfire in the staff lot at around 6:30 a.m. If there are no meetings outside of the school to attend, it stays there until 5:45. She used to spend the first hour planning her day and catching up on unaccomplished tasks. Now she spends it ushering kids through the newly installed metal detector. She has to convince herself that it is what's best for the school, even though it was the district's idea. It was also a district plan to convert Joseph Gallagher from a middle school to a Pre-K-8 school back in 2005. As a result, it's become one of the largest primary schools in Cleveland, leaving teachers like Francescani working out of storage closets. The school has simply run out of space. Joseph Gallagher is full of students who are considered "subgroups." Fifty-five percent speak English as their second, third, or fourth language. Another 30 percent are special ed. This means that just 15 percent are normal in the eyes of the state. Still, all but two students last year made enough progress to fend off No Child Left Behind, according to Vice Principal Sandra Velazquez. But that was two students short. "Two students," she says. "Two. That's how specific No Child Left Behind gets." Back in 2000, No Child was designed to stop the "soft bigotry" of public education. President Bush wanted to raise the expectation level for minority students. So he ordered testing to make sure they were improving. And if test scores of every kid in the school didn't go up, it was the fault of the school. It matters not if the previous year, the kids were living in rural Romania or the tribal lands of Africa. No Child gives students the opportunity to transfer out of schools decreed to be failing. And if such schools don't make adequate yearly progress, the state has the right to shut them down. In Ohio, April is the make-or-break month. Principal Rhone knows that Gallagher needs to pass this year. Failing again could lead to the belching out of a thunderclap of pink slips. They call it reconstitution — a rather polite term for dealing with schools that chronically suffer from low test scores, discipline problems, or poor attendance. By firing the entire staff and replacing it with new blood, the theory goes, a school can magically solve all the problems. So schools from San Francisco to New York have issued mass dismissals. It's been known to work. But it's a hard argument to make in Cleveland, where the district has been wedded to deterioration for decades. The assumption is that new teachers will somehow be able to outperform the old. But since the replacements are usually young and inexperienced, it's akin to stocking a baseball team with rookies and then expecting it to make the playoffs. In Cleveland, Paul Revere Elementary School was the last to be reconstituted, back in 1997. Outgoing Cleveland Teachers Union President Joanne Demarco says it did little if anything to change the place. Since then, there have been many threats, but no school has faced complete reconstitution. There have been plenty of "semi-reconstituted" schools. Joseph Gallagher is one of them. It happened when the district combined its middle and elementary schools, which led to a massive overhaul of staff. In 2005, according to one teacher, about three quarters of Gallagher's staff changed. The almighty test scores say it hasn't made a difference. Across the hall from Morell's room is a regular sixth- and seventh-grade class. This is where Tracy Radich teaches math. Her voice booms into the hallways, even when her door is closed. It's intense and energetic, similar to the voice of a high-school basketball coach. She's the newly elected sergeant at arms for the Cleveland Teachers Union and loves politics. If Anderson Cooper had a 12-hour election special, she'd watch all 12, then stay tuned for extra helpings of Wolf Blitzer. Radich is up front about Joseph Gallagher's deathwatch. "It's a constant threat hanging over your head," she says. "It's very difficult." In her mind, testing creates students who are jacks-of-all-trades and masters of none. If her class has trouble grasping a concept like mean, median, and mode, she doesn't have the extra time to spend. The test forces her to push on to the next unit. She has to make sure that her students have at least seen the material. Based upon their scores from the previous year, students are broken down into five groups: limited, basic, proficient, advanced, and accelerated. If they move up one level, the school is okay. If they don't, teachers can consider themselves screwed. "The tests are still given one week out of the year, and that determines everything," says Radich. "It's like if someone came to your work and watched you for one to two hours, and judged you and everything you do at work based upon those two hours. That's essentially what it comes down to — success or failure in two hours." But those are the rules they play under. So teachers like Radich are forced to concentrate on the borderline students. They're the most important kids in the classroom, since the school's fate hinges upon their improvement. Everyone else takes a back seat. Think of it as the NBA determining its post-season seedings by how well teams can get players like Dwayne Jones to perform. One subgroup that plays a critical role is the special-education kids. At Gallagher, 250 students have some sort of disability, ranging from mild autism to severe mental retardation. Fifty take an alternative test to measure their progress, which doesn't affect the school's rating. Another hundred or so aren't yet in the third grade, the year when their scores begin to count. This leaves around 75 who must take the state test. Teacher Keri Waring speaks like the daughter of a college president, because, well, she's the daughter of a college president. Her biggest complaint is that the test is geared for the kind of children congressmen know — those raised with money whose parents read to them at night and enforce lights-out at a reasonable hour. It's not geared for refugees on 65th Street in America's poorest city. What frustrates her is how others see Gallagher as the typical Cleveland school — rough, overcrowded, and failing. She cringes every time a new initiative comes down from on high. No plan can fix the endemic problems of poverty, parenting, and kids who don't understand the language you speak. "But all of this is political talk," she admits. "We still have to pass the test in April." At 2:30, students swell out of class and make their way home. Francescani returns to her storage closet to plan the next day. Aweys sits in the faculty lounge and dreams about affording classes at Tri-C. Radich sprints off to the union office. Morell switches around her seating chart, experimenting to find the perfect fit. Outside the building, buses and cars swing in and out of the parking lot. Rhone waves goodbye and politely reminds students that it's not okay to bomb each other with snowballs. Time before the test is short. But Joseph Gallagher has made it through another day. Poverty in plenty in "The Migrant Project"